Forced to take a cruise ship to babysit her foster sister, Caitlin has to face her own demons. But add to that her foster sister's and her friend's antics and Caitlin's inability to use her witch's magic over water and she has little hope to enjoy this trip. Until she meets a wheelchair-bound teen and wants to make friends with him in the worst way. Levka and his friends make a hasty retreat from Dallas before the vampire elders stake them for getting involved in human affairs--again. But when he meets Caitlin on the cruise ship, hating that he's so weak after being injured so severely that he has to use a wheelchair, he finds their troubles have just begun. It says this is the first in the Blood Moon Series but there isn't a second. I would like to know what happened next. The cover doesn’t really do anything for me, but the story is awesome. I really like Levka and his friends. I love their chivalry and that they feel obligated to help mortals. I love my main characters being good guys :) Caitlin is amazing because I don’t think I could endure her fear and traumas and not be a basket case. She is strong and stands for others even when she is scared. I love when the characters in the stories I read have outstanding character. I really do love all of Terry’s works. She is fantastic at writing her scenes so pictures jump to your mind. I never have to worry about not being able to picture what is happening, and it makes it very easy to be sucked into the story and connect with the characters. Now I’m going to be sad because I want to read more in this series, and I don’t think it is written yet or if it will be written. What made the experience of listening to Kiss of the Vampire the most enjoyable? The narrator was awesome! I could tell who was speaking from her voice. This was my 1st audiobook and she went above and beyond! What other book might you compare Kiss of the Vampire to and why? I was particularly moved whenever Levka showed how much he cared for Kaitlyn. He wasn't pushy... just showed her that he was there for her. Imagine combining Smokin' HOT vampires, one cute & friendly witch, and a cruise ship of partying teens on spring break in one FUN read! Did I mention that four of the vamps are on the run from their Dallas council? AND that there is a tracker/assassin on their tail? Oh my!!!!! Intrigue, romance, adventure, travel, humor, vampires, witches, magic... this book combined them all perfectly! I absolutely inhaled the story and my only complaint was that it ended too soon!!!! 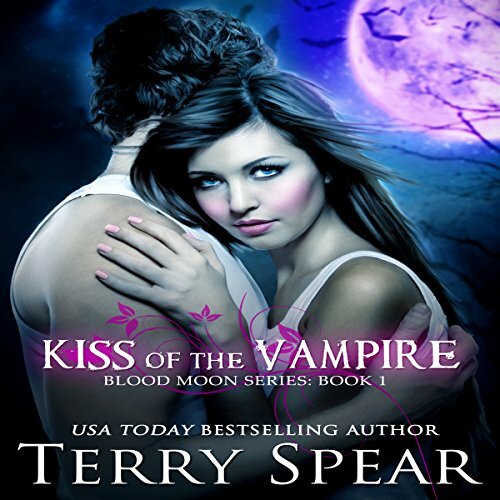 Kiss of the Vampire was Levka's & Kaitlyn's story. Their vamp/witch chemistry was simultaneously sweet and smouldering. The action was non-stop and never boring and the supporting characters were engaging. I'm thrilled that Terry has shared that she's working on a sequel to this book... I can hardly wait to read more of these characters and enjoy more of their adventures! LOL! Trouble certainly knew where to find them! This was the 1st audible book I've ever listened to while exercising and it did a bang-up job! I would get so engrossed in the story that I would forget that I was running! One minute I was holding my breath during an intense episode and the next I was laughing out loud at a ludicrous comment. I was completely oblivious to any of my normal body pains. That didn't happen when I listened to music! I would push myself to go further as I didn't want to stop listening and could hardly wait to exercise again to listen to more of the story. I'm hooked! Would you listen to Kiss of the Vampire again? Why? Yes. I've listened to this twice so far. What was one of the most memorable moments of Kiss of the Vampire? The most memorable moment was when Caitlin was almost thrown from the balcony of her state room. For some reason, I've always feared that would happen to me. I loved when Caitlin made her sister fall. I laughed at the funny parts and swooned at other parts. This book was so much fun. It's spring break and four vampires decide to sole away on a cruise ship to hide out from their council. But the cruise ship is carrying a bunch of mischievous spoiled high school students, villainous vampires, and a witch. All the characters were entertaining. This Romance has plenty of action that will keep you up all night and you won't want to put it down. I listened to it in audio version and loved the narrator.